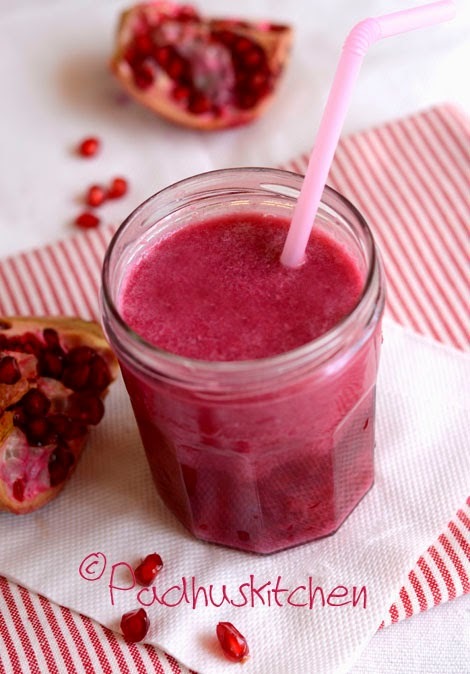 Pomegranate juice has many health and beauty benefits. It is packed with antioxidants, in fact it contains more antioxidants than many other fruit juices. Most commercially available pomegranate juice contains added sugar which reduces many of its health benefits. Homemade pomegranate juice is fresh, unprocessed, delicious, easy to make and takes very less time. Moreover extracting juice from fresh pomegranates retains most of the vitamins and nutrients. Today we will learn how to make pomegranate juice, how to peel a pomegranate and few health and beauty benefits of pomegranates. Cut the top crown of the pomegranate fruit to reveal the seeds. Then make 4-5 length wise cuts/slits on the outside from the top of the fruit starting from the crown to the bottom following the white pith lines (indicated by an arrow in the picture above). Then pull apart the fruit. That's it. Separate the seeds and discard the rind and pith. If there are few small white membranes or pith, do not bother as we are going to strain the pomegranate juice after blending it. Add 2 cups of pomegranate seeds and 1 cup of cold water in a blender/mixer. Blend it for a few seconds. Then strain the juice using a mesh strainer. Press the pulp with a ladle to extract as much juice as possible. If required add sugar to taste. I did not add sugar as the pomegranate was naturally sweet. Variations - You can add a tsp of lemon juice and a pinch of salt to the juice to enhance the taste. I personally prefer it plain. Pomegranates is loaded with antioxidants. Helps to fight breast cancer. Protects the arteries and reduces risk of heart diseases. Rich source of iron, which helps to cure anemia. Has anti inflammatory properties - helps to cure cough, sore throat and skin inflammation. Helps treat symptoms of Alzheimer's disease. Excellent source of vitamin C, vitamin K, folate and fiber. Slow down the process of ageing by reducing wrinkles and fine lines caused by constant exposure to sun. Inhibits the growth of lung, skin, colon and prostate tumors. Contains antibacterial properties, which protects our teeth from plaque. Reduces the risk of prostrate cancer. Protects against depression and osteoporosis. Note - If you are on medication, kindly consult your physician before you start drinking it regularly. If you love fresh fruit juices, smoothies, milkshakes, then check out my collection here. Good to know this tip.. Yes, you can. Then it becomes pomegranate milkshake.